Size: 36 x 24 x 60 (L X B X H) in inches approx. 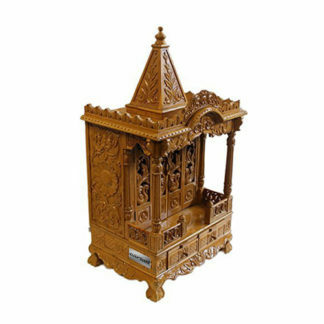 Handmade Wooden Temple by skilled craftsmen with premium quality finishing. Handling Time: 30 days approx. 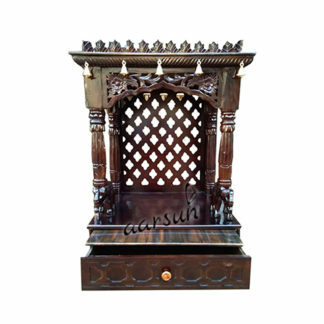 Aarsun Woods promotes to you this Hand-carved Wooden Temple Mandir in Teak Wood and Teak Ply. The Temple consists of one Dome and Mehraab at the Top. The Temple has a beautiful Peacock theme with Peacock Carved out a mast the Pillars and the Pillars supported by Elephants at the base. There is a slider tray in front with a knob for placing Diya / Dhoop. Beneath the Slider tray resides 2 Pull Out Sliding Drawers. The whole Temple sits on 4 Legs. The Wooden temple is polished in Traditional Natural Wood Color and can be polished as per your requirement. The temple consists of one dome and Mehraab at the top. The wooden temple has a beautiful peacock theme with peacock carved out a mast the pillars and pillars supported by elephant at the base. The lighting provision is also provided in Pooja room. The center also known as Grabgriha, is enclosed on all two sides in a jaali pattern. Also, in front top, hand-carved Mehraab is placed with the matching pattern.The main place where the idols are to be placed made of teak ply wood. The base part consists of a slider tray in front with a knob for placing Diya / Dhoop. Beneath the Slider tray resides 2 Pull Out Sliding Drawers. The whole Temple sits on 4 Legs. Termite Resistance: Sagwan wood has a natural oil content that resists termites (white ants), fungal stains, and also repels other insects that can destroy . One who has ever had termites climbing on walls all over the house, and eating all the expensive wooden temple before, will readily vouch for how important this benefit is. This termite and insect resisting quality in turn increases the life span of wooden mandir, and is the reason why Teak wood is superior compared to many other wood species in making wooden temple. There are a number of design are available in Wooden Temple we suggest you have a look at Teak Wood Temple , also at Aarsun Wooden Temple Teak Wood 3001 .